If you ever get the opportunity to visit Strasbourg in Alsace, France … go! I’ve just spent an incredible four days staying with my lovely friend, Julie, who lives in a village just outside the city. In fact, she’s responsible for my deciding that my WIP, currently entitled ‘Just for the Holidays’, was set in Alsace, as, when looking for a suitable spot for my English characters to spend August in France, I remembered her saying ‘You must come and stay!’ To have a built-in tour guide makes research five times easier. After strolling through the city and admiring the totally fantastic cathedral, we took a boat ride along the River Ile, which flows through Strasbourg and connects with the canal, to give me an overview of the city, the half-timbered buildings and steeply pitched roofs, the flowers, the ironworks, architecture and history. And I had to begin my exploration of local food and drink – Baeckeoffe, with Fischer beer. Baeckeoffe is a very hearty stew with three kinds of meat in it. Wednesday saw us at ‘Urgences’, the A&E department of l’Hopital Civil, where my character, Alister, is taken after rearranging his leg in a cycling accident. Of course, I wouldn’t intrude on anybody’s privacy by taking photos of their dashes to the hospital, but I was able to check out the building, the department, the surroundings and, via Julie (now turned translator), quiz the receptionist in Urgences as to what would happen to Alister after admission. (Transport to l’Hopital Hautepierre for his operation and aftercare). That day’s dejeuner was flammkucher and Meteor beer. (You see how seriously I take my research.) Later in the day we wandered for two hours around the village where Julie lives, taking pix of the gorgeous houses and the infrastructure of the place. I was particularly impressed by the pizza vending machine. I’m going to draw a veil over later standing outside Julie’s apartment with my case as I waited for taxi after taxi that ‘had a problem’, ‘seems to be lost’ and couldn’t find the apartments. Suffice to say, I got a bit anxious. But, eventually, I was on my way, arriving at the airport in time to kiss my hostess goodbye and join the tail of the line for airport security. Today I’m back at my desk with over 200 photos, leaflets, notes and memories, to weave into my manuscript. So, bye then! I have work to do. Picnics in Hyde Park is a book I’ve been waiting to read since the first chapter, under another title, was shortlisted for a Novelicious competition. I was completely intrigued but, though Nikki Moore is my niece (and I’m very proud of her), she has steadfastly and perniciously refused to tell me What Happened Next! Now that the book has hit the shelves, I forgive her. Picnics in Hyde Park is safely on my Kindle and is my designated travel companion on my next trip, when I fly to Strasbourg on research for my WIP, currently titled Just for the Holidays. Happily for me, that’s only next week! I’ve read all of the novellas that led up to Picnics in Hyde Park, (the #LoveLondon Series). They have, deservedly, hit the Amazon UK charts. ‘The writing style is impeccable. How I’ll fill the void left by this series is something I’ve not yet figured out an answer to.’ K.L Beeden, Books with Bunny. 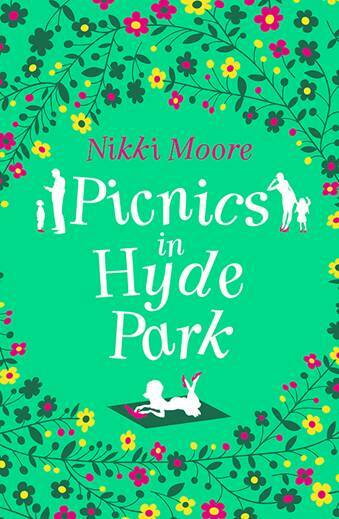 Happy publication day to Nikki Moore for Picnics in Hyde Park.